Our efforts to weigh the supreme court in Wisconsin against those in Minnesota and Iowa have found that the record compiled of late by the justices in Madison diverges from the performance of their colleagues in Minnesota and Iowa with regard to (1) the number of decisions filed per term, (2) the length of these decisions, and (3) certain measures of polarization. Today, by adding the supreme courts of Illinois and Michigan to this enterprise, we’ll see if Wisconsin remains an outlier even after the inclusion of two more entries on our spectrum of state supreme courts. Turning first to the volume of decisions filed during the three most recent terms (2013-14 through 2015-16), we find a larger number coming from Illinois (66 decisions per term) than from Wisconsin (52 decisions per term). 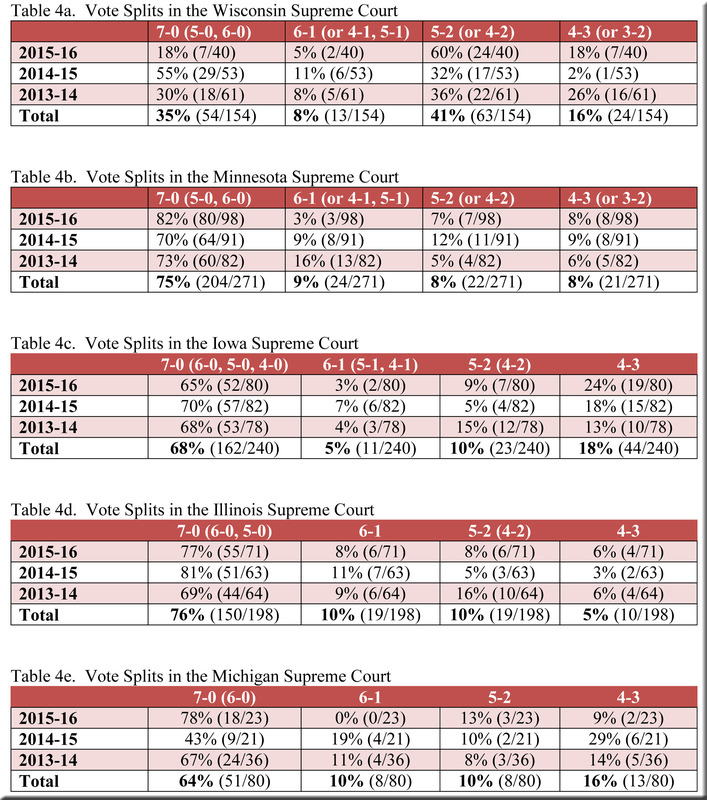 The difference between Illinois and Wisconsin is not as great as it is between Wisconsin and Iowa’s 80 decisions/term (to say nothing of Minnesota’s 91 decisions/term), but the gap is clear, as detailed in Table 1. Something of a pattern would seem to be emerging, then, and one might venture to guess that Michigan’s supreme court would join those of the other states in surpassing Wisconsin’s total. But nothing of the sort has happened. Not only did the justices in Michigan file fewer decisions than even their counterparts in Madison, the total from Michigan was far below that of Wisconsin. Indeed, at a mere 27 decisions per term, Michigan’s average amounts to only about half of Wisconsin’s (and less than a third of Minnesota’s). In this respect, at least, Wisconsin is no longer the outlier. In other respects, though, Wisconsin remains well outside the range of statistics pertaining to its four neighbors. Regarding the number of pages required by the justices to convey their decisions, displayed in Table 2, Illinois (at 23 pages/decision) and Michigan (31 pages/decision) are much closer to Minnesota (20 pages) and Iowa (29 pages) than any of the four states are to the sprawling decisions emanating from Wisconsin—fully 53 pages per decision on average. When these decisions are divided into their component parts, we find that the justices in Madison are separated most drastically from their counterparts in the other states by the average number of pages devoted to concurrences and dissents. However, the majority opinions, too, are much longer in Wisconsin than elsewhere, as shown in Table 3. As one measure of polarization, we’ve been tracking for some time the percentage of decisions that were either unanimous or “contentious”—with contentious decisions defined as those decided by votes of 4-3 or 5-2 (or, rarely, 3-2 or 4-2). Table 4 reveals that all of the Badger State’s neighbors posted much higher percentages of unanimous decisions and, correspondingly, much lower percentages of contentious decisions than did the Wisconsin Supreme Court. This disparity is especially vivid in view of information regarding the party affiliations of the justices provided for some states (though not Wisconsin). In Illinois, for example, four of the justices are identified as Democrats and three as Republicans. Such a lineup might seem destined to yield numerous contentious decisions and comparatively few unanimous outcomes, similar to the pattern in Wisconsin. Instead, during the three terms under consideration, 76% of the Illinois Supreme Court’s decisions were unanimous and only 15% were contentious—a remarkable contrast with Wisconsin, where only 35% of decisions were unanimous and 56% (at least double the rate of all the other states) were contentious. In order to be consistent, I am excluding per curiam decisions, summary affirmances (Minnesota), and memorandum opinions (Michigan) from the totals for all five states. Also excluded are rulings on various petitions, motions, and attorney disciplinary matters. When two or more cases were consolidated and resolved by a single decision, I counted the decision only once. If we included per curiam decisions and memorandum opinions in these averages, the gap between Michigan and Wisconsin would still be very large—33 decisions per term for Michigan, and 53 for Wisconsin. The calculations include title pages, majority opinions, and separate opinions. Here again, and in the following tables, per curiam decisions (and summary affirmances and memorandum opinions) are omitted. Lines in decisions by the Illinois Supreme Court are single-spaced, but in decisions by the other four supreme courts they are double-spaced. In order to compare the length of the Illinois decisions with those from the other courts, I counted the number of characters on several pages of the decisions from the other courts and then calculated the average number of characters on one double-spaced page. I used this figure to divide the number of characters in the opinions filed by the Illinois Supreme Court and thereby arrived at a reasonable approximation of the number of pages that these Illinois opinions would have required if they had been double-spaced. Finally, I added one page to the double-space approximation of each majority opinion from Illinois in order to account for the title page. Thus, the figures that appear in the table’s column for Illinois are only estimates of double-spaced equivalents, but they are sufficiently accurate for the rough comparisons made in this post. Title pages are included in the page counts of majority opinions. Three fractured decisions—State v. Lynch (Wisconsin, 2011AP002680-CR); In re the Guardianship of Jeffers J. Tschumy (Minnesota, A12-2179); and State vs. Tyler (Iowa, 13–0588)—are omitted. Click here for a set of more-detailed tables showing the vote splits, term by term, in each of the five states individually.